Hello beautiful friends, & for all you newbies – welcome to Rachael Sage's latest Newsletter! So many exciting and wonderful things are in the works already in 2017 for Rachael, including a brand new video, an EP of brand new material just in time for Valentine's Day, upcoming tours with Grammy®-nominated blues artist Beth Hart, and '80s pop icon Howard Jones! Details below, and we hope to see you at a show very soon! BLURT MAGAZINE PREMIERES RACHAEL'S NEW VIDEO FOR "TRY TRY TRY"! HOWARD JONES INVITES RACHAEL TO SUPPORT UK SHOWS IN MARCH! ON TOUR: ATLANTA, NEW YORK, BOSTON, LONDON, GLASGOW, DUBLIN & MORE! In case you missed it on Rachael's social media, last week BLURT Magazine featured the exclusive premiere of the brand new ballet-pop video for her hit single "Try Try Try"! Directed by award-winning filmmaker and photographer Tom Moore, the video stars professional ballerina Abigail Simon (American Ballet Theater, Joffrey Ballet) and Broadway actor/dancer Marty Lawson ("Smash"), alongside Sage and guitarist James Mastro, violinist Annette Homann, and drummer/fellow MPress artist Dom Kelly. Choreographed by Sarah O'Gleby (The Tony Awards, Ted 2) and filmed by longtime collaborator Mike Flanagan ("Wax", "Coloring Book"), the video was shot in Newburgh, NY and fuses many of Sage's dance inspirations including the enduring legacies of Gene Kelly, Fred Astaire and Ginger Rogers, as well as "An American In Paris" and her own immersion in Balanchine's ballet technique as a student at The School Of American Ballet. Read the official Press Release and watch the video on YouTube HERE, and please share it far and wide!! 2. 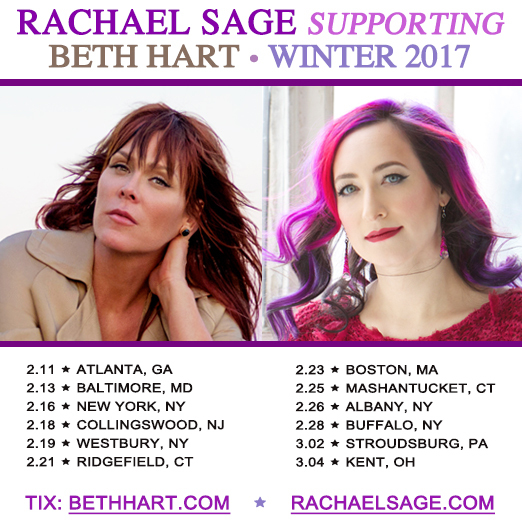 RACHAEL SAGE + BETH HART = FIERCE, FIERY FEMALES ON TOUR TOGETHER! Beginning February 11th, Rachael will embark on one of her most exciting tours yet, as support for Grammy®-nominated blues-rocker Beth Hart's US CD Release Tour. Sage, who has been a longtime fan of Hart's voice and followed her since she starred in the theatrical production "Love, Janis", could not be more excited to join her at such venues as Center Stage Theater in Atlanta GA, Foxwoods Theater in Mashantucket, CT, and The Town Hall in her hometown NYC. For tickets and more info, read the official press release. Our ever-prolific songstress is never out of the recording studio for very long, and has been hard at work on several new songs spotlighting topical events and issues. Perhaps her most socially-conscious effort to date, her new EP "The Tide" overflows with her signature poetic lyrics and a compassionate perspective sparked by humanitarian Elie Wiesel, the 15th anniversary of 9/11, The Syrian refugee crisis, the Pulse shooting in Orlando, and the 2016 Presidential election. The collection will only be available at live shows and via iTunes, where it will be officially released just in time for Valentine's Day on February 10th. 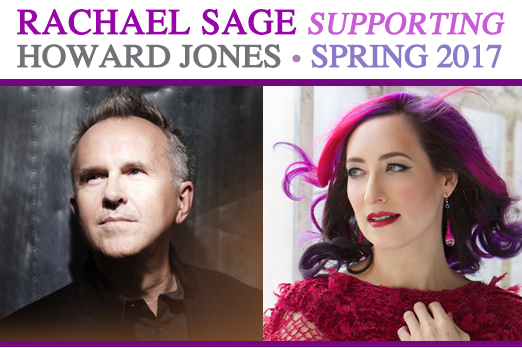 Rachael could not be more thrilled to be joining one of her most beloved musical influences, Howard Jones, on tour in the UK this March! A pop icon whose unique synthesizer-based arrangements burst onto the UK scene in 1984 with the hit song "New Song", is perhaps best known for such global smash hits as "Things Can Only Get Better" and "No One Is To Blame" (the latter of which Sage used to perform in college at her weekly coffeehouse gig). To read more about her personal relationship to Howard Jones' music and to purchase tickets, read the official press release. This past weekend, Rachael joined members of the MPress Records team along with 400,000+ other New Yorkers – and over 3 million people worldwide – in the Women's March. We were proud to participate in Democracy at its best, and it was an honor to be able to join our dynamic and diverse fellow citizens in a peaceful demonstration championing women's rights, LGBTQ rights, immigrants' rights, diversity, and our collective concerns for the environment. As so many signs put it best: "Woman's Rights = Human Rights". Check out Rachael's photo gallery of the day's events, HERE. 6. UPCOMING SHOWS IN US, UK & IRELAND: TICKETS ON SALE NOW! It's going to be a busy couple of months as Rachael gears up to tour the U.S. East Coast with Beth Hart, the UK with Howard Jones, a stint in Dublin, Ireland with roots-rocker Eoin Glackin, and a handful of other hotspots including a co-bill with the extraordinary Phoebe Legere in NJ, a headline show in Providence, RI and more shows with super-talented twins Nalani & Sarina. For a full list of destinations see the sidebar of this newsletter, or visit www.rachaelsage.com/tour.